We are regulated by CQC and authorised and regulated by Bradford Council. 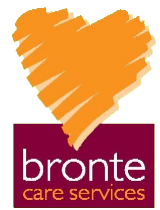 Bronte Care Services is a UK registered trade mark of Bronte Care Services Ltd. If you have any concerns about material which appears on our site, please contact by email (click here).